Isometric –Where there is contraction of the muscles occuring, but no movement. Concentric – The muscle contracting is shortening, so in the bicep curl, the muscle shortens by flexing the elbow. 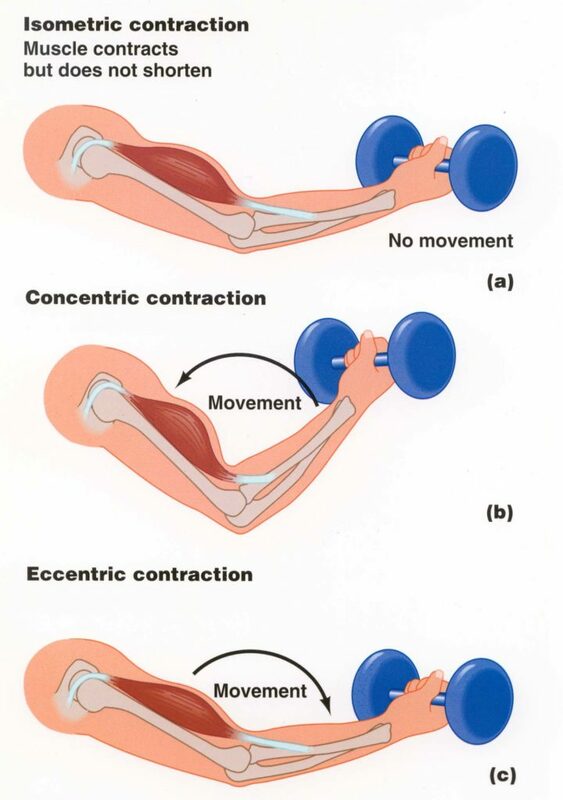 Eccentric – This contraction is happening as you lower the dumbbell. When a load is placed on a muscle during the eccentric phase (lengthening), it is causing an increased tension force placed on the muscle at a microscopic level. I won’t go into detail about the cellular physiology, but this micro-trauma triggers receptors within the muscle tissue (called nociceptors) that give you that sensation of pain. The plus side is that you make most of your strength gains from the eccentric load placed on the muscle. So, always when you are lifting weights, make sure to keep it slow and controlled, focusing on the eccentric phase just as much, if not more, as the concentric phase. Our bodies are masters of adaptation, as with anything you keep doing regularly, our body is going to get used to it. That is why the DOMS symptoms are felt typically in strenuous exercise that we are unaccustomed to. You can reduce DOMS by gradually progressing yourself into a workout routine. Start slow and don’t push yourself too hard in the beginning, picking up intensity over time. Another theory, referred to as the “enzyme efflux theory”, may be linked to the pain as well due to an accumulation of Calcium in the damaged tissue. Through a series of events, the body needs to repair this tissue, and inflammation occurs, resulting in pain as well (that is the shortened explanation). Massage is great at alleviating the symptoms of DOMS post exercise. As I mentioned earlier, it is not going to have anything to do with “flushing lactic acid through your system”, unless you get a post-event massage within an hour of your activity. Lactic Acid is not the issue anyway when it comes to the muscle soreness. It will definitely help at speeding up the recovery by increasing blood flow/circulation to the damaged muscle tissue. And, it just feels good! With exercise, also comes muscle tightness, adhesions, and decreased range of motion. Massage will help to restore function to these tissues and keep you feeling flexible in order to reduce the risk of injury as you get back into your training. This entry was posted in Exercise, Massage and tagged delayed onset muscle soreness, DOMS, DOMS massage, lactic acid, lactic acid buildup, lactic acid myth, massage for delayed onset muscle soreness, massage for DOMS, sports massage.